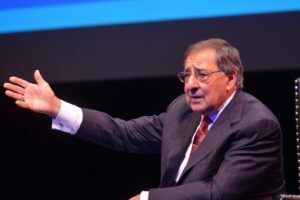 Former Secretary of Defense and past CIA Director Leon Panetta spoke to a full house at UCLA’s Schoenberg Hall on Monday, March 30. Appropriately titled, “A Conversation With Leon Panetta,” the intimate atmosphere of the event gave the audience an opportunity to listen and interact with the man who ended the US military’s “Don’t Ask, Don’t Tell” policy, blocked offshore oil drilling on the West Coast, and, perhaps most memorably, directed the operation that killed Osama bin Laden. Poised comfortably on an armchair facing the audience, Panetta discussed his life, work and perspective on current policy issues in response to questions moderated by UCLA Luskin Senior Fellow Jim Newton. Panetta opened the evening with stories from his personal life, from growing up in an immigrant family to serving in the army and eventually entering the political arena. Panetta started his political career as a legislative assistant under Republican Senator Thomas Kuchel. When asked why he switched parties, Panetta explained that at the same time he was working to implement desegregation of schools in the South as director of the Office of Civil Rights, President Nixon agreed to back down on strong civil rights enforcement in return for support from Southern Republicans. “One day, I woke up and one of the papers in Washington had a story that I resigned [though I had not] . . . I became a Democrat soon after that,” Panetta said, garnering laughter from the audience. The conversation soon turned towards policy, and Panetta offered his critique of the current situation in Washington. Panetta emphasized repeatedly that the inability of the government to make decisions about policy issues is severely hurting the country. Held as a co-presentation of the Luskin Lecture Series and the Daniel Pearl Memorial Lecture, Panetta’s appearance was preceded by introductory speeches from Dean Franklin D. Gilliam, Jr., and Judea Pearl, father of Daniel Pearl and head of the Daniel Pearl Foundation. Pearl reminded the audience that this event was created to honor the life and work of his son, whose pursuit of truth in journalism led to his abduction and murder by terrorists in early 2002. 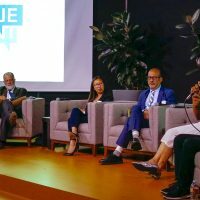 The Pearl Memorial Lecture is held annually at UCLA and Stanford in order to highlight figures who uphold Daniel Pearl’s lifelong cause to preserve truth, integrity, and transparency for all. 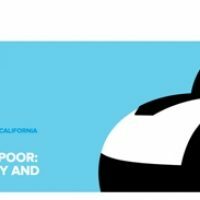 UCLA Luskin, the UCLA Burkle Center, UCLA Hillel, and the Daniel Pearl Foundation worked in conjunction to put on the Schoenberg Hall event. A podcast of the event is available here.